Kyle Says BOHEMIAN RHAPSODY Is An Entertaining Yet Uneven Film. The band Queen is one of the greatest bands of all time and my personal favorite band, only behind Van Halen. When they announced a movie about them with the primary focus being the most iconic front man Freddie Mercury, people were more than excited to say the least. Now the film is finally here with Rami Malek playing Mercury and the released stills were stirring up the right rumble. Could Bohemian Rhapsody be the film that perfectly tells the story of Queen and honors its legacy? No, but it is still an enjoyable film. There is a conflicted feeling this film gives. There is greatness, but also things that are incredibly frustrating. Bohemian Rhapsody did not have an easy road to production. Director Bryan Singer who gets the directing credit on this film is currently surrounded in controversy. So much so, that he stopped showing up to set and Dexter Fletcher had to step in after Singer was eventually fired. Singer is accused of horrid things, but you can go and research that. In addition to a director change, we also had a lead actor change from Sacha Baron Cohen to Rami Malek. What we got is a very enjoyable film that is uneven to start. This film suffers the most from how heavily the band was involved. There is nothing shaky or controversial while telling their story, it’s sort of just a best hits and playing it safe until the drama comes around. That may not be a bad thing for most audiences, you just want a little more depth when it comes to the beginnings of the band. It feels as if many things are skipped over when you know there is so much more to tell, and this is what keeps this movie from being great. It became frustrating, but it gets so much better. As previously mentioned, Freddy Mercury is a musician that transcends generations. He is larger than life and a personality that is unmatched by anyone with talent like no other. 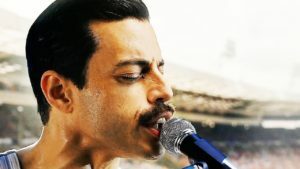 With this known, Bohemian Rhapsody needed to find a perfect actor to play the role, and they did. Rami Malek is absolutely perfect as Freddy Mercury and portrays the singer as if he was able to call upon his spirit. He nailed the walk, the talk, and all the little quirks that are incumbent of Mercury. What Malek did is nothing short of remarkable and you will be blown away by the performance given. What matches the most is the look and the personality. Freddy Mercury has a unique look that Rami matches with every feature from the mustache on. The personality is one of flamboyancy and confidence which Malek brings that well. This man is one of the front runners for the best actor Oscar this year and as of now is my pick to win it all, depending on how Christian Bale does in Vice. Regardless, this is a performance that will be remembered and talked about forever. 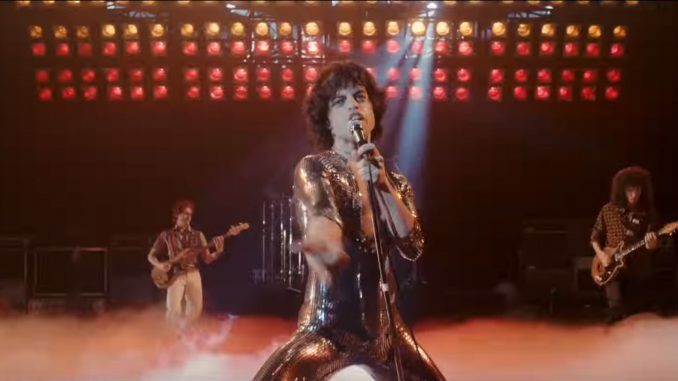 The one thing everyone can recognize from Queen is their music, and it is one of the things that help this movie be better than it is. 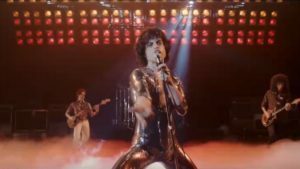 From “We Will Rock You” to “We Are the Champions,” Queen has some of the most memorable music ever made, and seeing it made in the film is one of the highlights. Seeing them come up with the idea for “We Will Rock You” is great and how they told the story of their creative process is told very well. These are some of the best scenes in the movie as you discover where these songs came from. “Another One Bites the Dust” is particularly one of my favorite scenes. However, the scene everyone will be talking about is the ending and wow is it incredible. We see them perform a concert in Wembley Stadium and after all they went through and the circumstances of the film, you cannot help but be in awe and sing along. Malek puts on a show in this concert to the point where it induced goosebumps. Regardless of how you feel at that point in the film, you will walk out with a smile on your face. 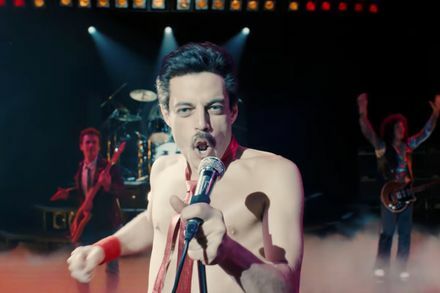 Bohemian Rhapsody is a very uneven film about one of the greatest bands ever. There are moments where risks aren’t taken, but when they are they pay off beautifully. Rami Malek puts on a performance of a lifetime and helps to make this movie much better than it should. 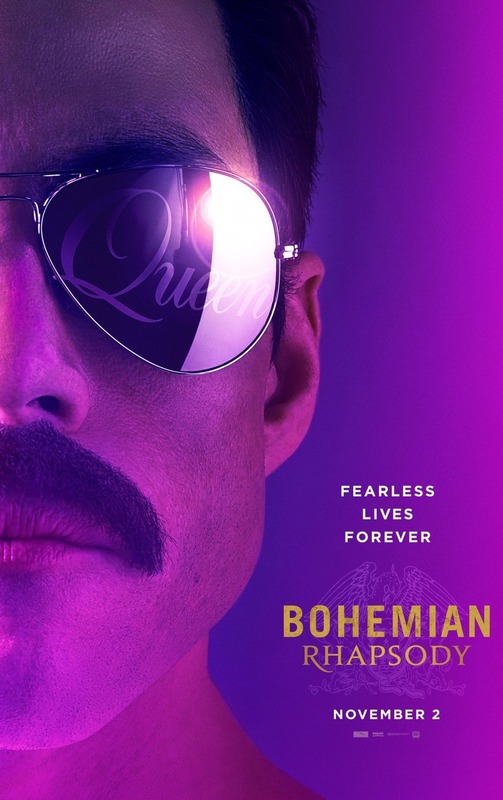 If you are a fan of Queen, you will love this film and I recommend you go see it. Freddie Mercury would be proud.